“The Fifth Estate,” kicked off Toronto with a mixed response despite strong performances from Benedict Cumberbatch and Daniel Bruhl. Meanwhile, “Captain Phillips” was privately screened to the press and mostly positive reviews have come through for it. Primarily citing the performances of Tom Hanks and newcomer Barkhad Abdi. “Enough Said” screens to bigger crowd today, but was met with some positive reactions mostly addressing the pleasantness of seeing Gandolfini post-mordem. Ripped from headlines that still feel wet (even if its suvjects might feel that phrasing fives print media too much credit, “The Fifth Estate” dramatizes the fast, controversial rise of anonymous-whistleblower website WikiLeaks and its figurehead, Julian Assange. Aiming to provide kind of speculative personality portrait behind another sweeping digital-age change in communication that touches nearly everyone, a la “The Social Network,” helmer Bill Condon and scenarist Josh Singer’s film must also stuff in a heavy load of global events, all in a hyperkinetic style aping today’s speed of information dispersal. Results can’t help but stimulate, but they’re also cluttered and overly frenetic, resulting in a narrative less informative, cognate and even emotionally engaging than Alex Gibney’s recent docu “We Steal Secrets: The Story of Wikileaks.” Initial interest should be high, though likely mixed critical and word of mouth response may dampen B.O. staying power. 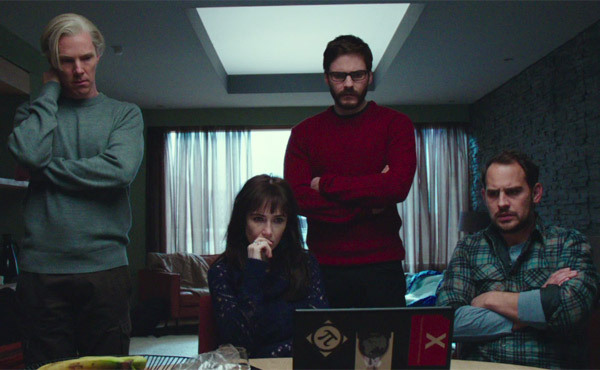 @sleepyskunk: THE FIFTH ESTATE: A frantic techno-beat thriller that shares more in common with HACKERS than THE SOCIAL NETWORK. @DavidPoland: The Fifth Estate is a talk movie, not a scream movie. Cumberbatch gives a very human performace though Assange is such a drama queen. @nprmonkeysee (Later): Oh, and people typing on computers will never be exciting in a movie. So stop trying. “The result is a kinetic docudrama that always impresses without ever connecting emotionally in quite the same way as the helmer’s prior “Bloody Sunday,” and “United 93,” with which “Phillips” forms a loose trilogy of average Joes and Janes caught in the throes of politically motivated violence. Setting sail with an opening-night berth at the New York Film Festival (where another seafaring epic, “Life of Pi,” launched last year), this impeccably well-made, gripping but grim survival tale should spark a flurry of awards buzz for star Tom Hanks and powerful Somali newcomer Barkhad Abdi, but may prove too grueling to make major waves with Academy voters or the muliplex crowd. “It’s hard to imagine “Captain Phillips” in the hands of any other filmmaker – and “Captain Phillips” in the hands of Greengrass looks exactly like anyone familiar with his work would expect. It does justice to the material even while playing too conscientiously by the book. For better or worse, Greengrass’ virtuous approach is a thinkpiece on imperialism that’s been smuggled into commercial escapism. The Wrap gives a review that focuses more on politics than the movie. Captain Phillips has only screened for press, no tweets available yet. @DavidPoland: There is something very powerful about watching Gandolfini playing a role in Enough Said where he just talks like a regular guy. @Breznican: First #TIFF13 screening was a great one. “Enough Said,” such a funny & touching love story between Julia Louis-Dreyfus and James Gandolfini. @Breznican (Later): Funny as “Enough Said” is, there’s undeniable poignancy to Gandolfini being gone. But it’s nice to see him again, for one of the last times. “Enough Said” will screen to a larger audience later on in the festival. Festival Circuit: Toronto -“The Railway Man,” “Dallas Buyers Club,” and more.